The exhibition Flowing Movement—The Material Imagination of Ian Boyden will be on display at the Suzhou Museum from July 1 through July 31, 2012. The exhibition, which occupies the entire contemporary wing of the I. M. Pei–designed museum, features a selection of twenty recent paintings and prints, seven artist's books, and three video installations. Curated by the art historian Bai Qianshen, this is Boyden's first museum exhibition in China, where he has gathered an enthusiastic following. Boyden's artist's books are admired for the way they bridge tradition and innovation as related to materials and form. They range from polished and etched slices of meteorites to extensive printed collaborations with other artists, composers, and writers, including Chang Ch'ung-ho, Sam Hamill, and William Bolcom. The video installations provide a poignant environmental commentary on the human relationship with the natural world, documenting the transformations of a series of self-portrait sculptural heads. Some of these were composed of various food and left in the wild to be consumed by birds, fish, and bears and others were made of concrete or resin and then subjected to the forces of river currents and ocean waves. 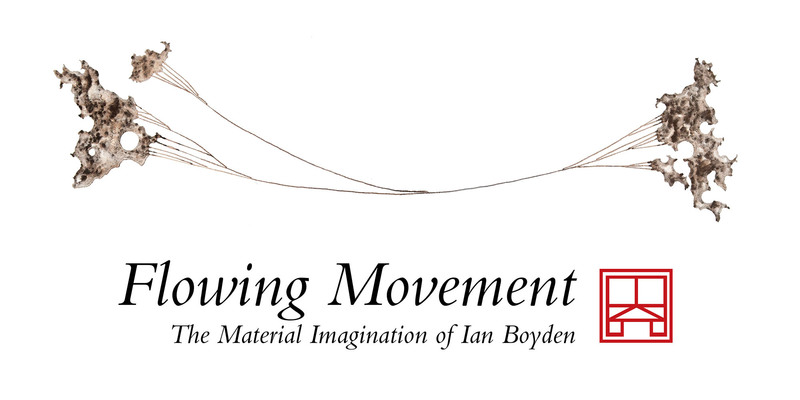 The opening reception for Flowing Movement—The Material Imagination Ian Boyden will be held on July 6, 2012. During the opening, the poets Sam Hamill and Jennifer Boyden will give readings, and there will be a panel discussion on ink. The exhibition is accompanied by a fully illustrated, bilingual catalogue with texts by Boyden, art historian Richard Barnhart (Yale University), artist Timothy C. Ely, and art historian and curator Bai Qianshen (Boston University), published by Shanghai Cultural Press (ISBN: 978-7-80740-902-1). The exhibition is organized in collaboration with J.Y. Fine Art, Suzhou. Within walking distance of the Northern Temple Pagoda and the Humble Administrator's Garden, the Suzhou Museum is located at 204 Dong Bei Street, Suzhou, 215001. Tel: (86) 512-67575666. Open Tuesday–Sunday from 9 am to 5 pm. Admission is free to the public. Qianshen Bai, Associate Professor, Department of Art History, Boston University. Yale University Ph.D (1996). Foremost authority on Chinese calligraphy in the West. Prolific author of numerous scholarly articles as well as his path-breaking book Fu Shan's World: The Transformation of Chinese Calligraphy in the Seventeenth Century (Cambridge, Mass: Harvard University Asia Center, 2003). Ian Boyden (b. 1971) is a painter and book artist based in Walla Walla, Washington. His artistic practice reflects an intense interest in East Asian aesthetics, material relevance, and poetic imagination. He studied in China and Japan, and received degrees in the History of Art from Wesleyan University and Yale University. In 1998 Boyden founded Crab Quill Press, an imprint through which he has published several artist's books. His work has been exhibited widely and is found in numerous public collections, including Reed College, Portland, Oregon; Stanford University, California; Portland Art Museum, Oregon; and the Victoria and Albert Museum, London. As director of the Sheehan Gallery at Whitman College, Walla Walla (1998–2007), he curated numerous exhibitions exploring diverse subjects such as contemporary artists of the Northwest, Chinese calligraphy and scholars' stones, genetic imaging, and climate change. Boyden has authored and coauthored several books, including The Tables of Jupiter: Graphic Work by Timothy C. Ely (2004), Reflections on Forgotten Surfaces: The Calligraphy of Hua Rende (2005), and Roots of Clouds, Transcendence of Stones (2006). Ian Boyden Meteorite—Chan, 2012 meteorite on paper, 120 x 170 cm.